Creative Art Gifts for Your Family and Friends! We all want to be as creative as we can be when it come to gift giving. Gifts are not only material things we give to people we love but symbols of our gratitude, appreciation, and most of all the love we have for these people. If you are planning on giving a gift to your mother, sister, cousin, best friend, or spouse, it should be something unique, creative, and special that he or she would definitely want to hang up on their walls. An art gift is a painting, portrait, handicraft, or any other creative gift that you give to your loved ones. We at Direct Art Australia offer all kinds of oil canvas paintings and portraits that are not only artsy but professionally done by skilled artists all over the country. The oil paintings you see in the galleries here in our store are all done with utmost care and skill, making it a perfect art gift to give to your friends and family. that uniquely done by our professional artists. Oil paintings are made with different colors, styles, and subjects that you won't feel limited at all if this was the art gift you've chosen to give. If you're out of art gift ideas, you may like the idea of buying a famous reproduction of a classic artwork for your loved ones. If you have a friend who's been dying to own a Van Gogh or a cousin who's constantly looking for Degas' Ballet Dancers in the Wings, you can get them a high quality reproduction that is so similar to the original and affordable for the pocket. These are art gifts perfect to give to friends who are art fans or family members who collect artworks of a particular painter. A portrait from photo is also a unique art gift that totally shouts out "CREATIVITY". By taking some of your most memorable photos, you can turn them into everlasting portraits that will surely become treasures for generations to come. 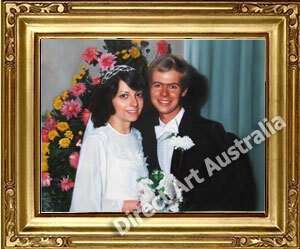 Direct Art Australia offers services with portraits from photo at affordable prices, so if you want a totally unique and creative art gift this is the kind of package you should be getting for your friends and family. Creating an art gift to give to him or her can take a long time and a lot of effort on your part, so why not just leave the creating to us and just wow your friends and family once we've finished your orders? Just take a look at all of our galleries and you'll see just how wide our selections of possible art gifts to give really are. You can rest assured that you will only pay the price of the work because shipping is free to all locations in Australia, including Melbourne, Sydney, Brisbane, Perth, and Adelaide.